We reviewed the original Vax Air Cordless and gave it high praise with a full five star rating! We liked the fact that it favoured a traditional upright design with a hose. Now Vax have reimagined this design to incorporate a lift-out cylinder for anticipated easier cordless hose cleaning. So how does it stack up against the latest cordless cleaners? 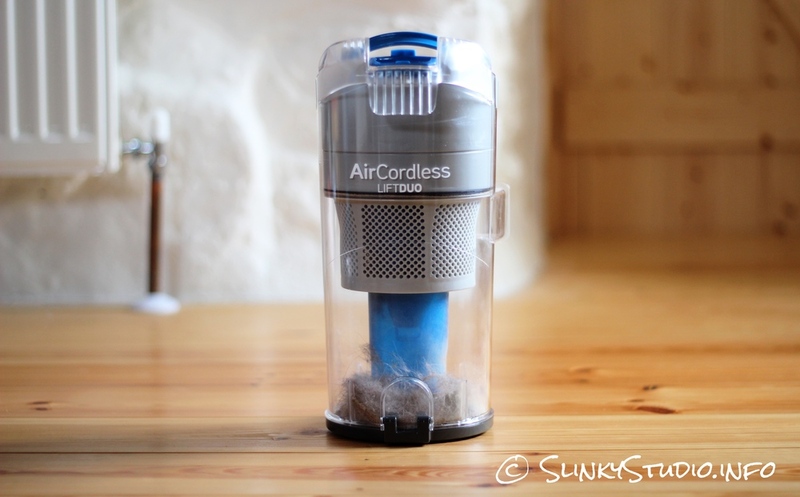 The similarities between the Vax Air Cordless Lift (model no. U85-ACLG-B) and Vax Air Cordless are fundamental. Consequently they share the same 6 year warranty, silver/blue design scheme, 1L translucent bin capacity, cyclone technology, WindTunnel3 enabled motorised head, tools and batteries. This is definitely not a bad thing, as we had nothing seriously critical to say about the older model other than the power button needed too much force to engage for our liking. Assuredly the Lift does have a few new neat features that the older sibling didn’t; such as LED headlights - something we’re familiar with on the cordless AEG UltraPower cleaner - they highlight dirt on hard floors particularly well. Furthermore we have a boost power button (as well as power & brush bar toggle), taking suction to a further height. Visually it’s a smart, modern and, importantly, not a very heavy or bulky cleaner. Dimensionally it tucks away in corners of rooms or under stairways without being an eyesore. Moreover the total 5.5kg weight and dual handles make lifting upstairs a less strenuous and awkward task. The Lift comes in ‘Solo’ (£249) and ‘Duo’ (£349) variants - to specify the number of batteries supplied. We have the Duo variant and we achieved 25 minutes of runtime from each 20V battery, giving a combined runtime of 50 minutes of general cleaning (boost mode halves runtime). In contrast, the similar in performance Dyson (DC59) V6 Animal attains an identical 25 minutes from its inbuilt non removable single battery. Vax batteries include 3 bar LED charge indicators and are easy to swap over. For family households, where the duty of the Lift is intended as the primary cleaner, the Duo option is a must! Batteries are charged via a supplied battery dock; a method nearly exclusive to outdoor cordless tools. Whilst the Vax doesn't have a permanent dock for residence, the bright side of this is that one battery can always be charging whilst the other is in use. Portable Cleaning: Vax yanked the chord from the traditional upright cleaner design and now they’re really expanding the formula into the entirely different area held by the likes of the Dyson Animal DC59/V6 compact cordless cleaner. The first Vax Cordless model could be restrictive when trying to reach celling height and as with most cylinder uprights it always had to be wheeled around as you cleaned. Thankfully the Lift has a significantly longer hose, and the beauty of a lift-out cylinder means it works with you; making it easy to travel throughout the house for spot cleaning, car cleaning and longer stretches of ceiling dusting. For the latter task we found the removable wand very helpful in avoiding the fatigue of stretching given its additional height. When utilised like this, the Vax’s body is intended to be held from the top handle in one hand and the hose in the other. Whilst it’s only a backpack away from making users look like a Ghostbuster, it isn't cumbersome to whisk away from the cleaner or to unravel the hose. The cylinder, when disengaged from the body, loses 1.8kg, resulting in 3.3kg total weight. Not as light as the ultra-compact 2.0kg Dyson (DC59) V6 Animal though, which is designed to reach every nook and cranny in a home. Supplied accessories are an articulating brush tool, an anti-static nozzle and a 2-in-1 crevice tool. All are useful, but we mainly use the crevice tool for portable cleaning. The main reason being that we have pets, and cleaning windowsills and curtains in areas where they sleep is a near daily event, with the 2-in-1 tool being excellent for this. The Vax Air Cordless Lift enables considerable portability on a level where the hose allows for the cylinder body to be just below shoulder height. If cleaning demands greater heights we can sit the Lift body on the floor and the stability gained from the triangular stand allows us to reach curtains and even to clean/climb stairs gradually. Floor Cleaning: 5.1kg total weight means pushing the cleaner over rugs and carpets is not a jarring task. In fact, the lightweight design makes cleaning quite a joyous experience, made better by the pivoting cleaner head which reaches new levels of usefulness we’ve not previously seen in any Vax cleaner. This is because there is a significant gap between the cylinder body and motor head, which allows deeper entrance under furniture such as low chairs and sideboards - the areas that too frequently get forgotten about. We remain impressed with the Vax Cordless range and with the swift and nimble movement from the pivoting head it doesn't strain the arm at all: essential for working around furniture. Not to neglect to mention its rubber bumpers that protect walls and furniture; but what we genuinely found useful was the LED lighting that highlights debris on hard floors very well and offers visibility in shadowed areas too! Carpets: Day to day cleaning of tight grain, thin to thick pile carpets around our studio has shown reassuring results. The Lift is no different to the original Vax Air Cordless where carpet cleaning is concerned. The only new additions here are the boost mode and side brushes to disturb debris against walls, chair legs, etc. 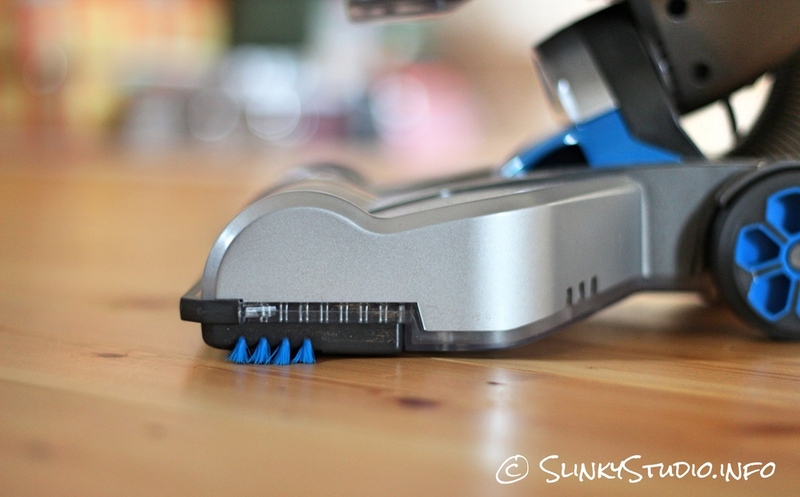 The robotic iRobot Roomba 880 proves how effective side brushes can be, so we like this addition! Although the boost mode, along with the WindTunnel3 technology of channelling three gateways of suction from the cleaner head, determine a faster clean, it will take extra battery life - diminishing twice as fast. We tend to find more purpose in the boost mode when using the hose. In standard mode it still manages to perform much like a chorded upright, attracting the very fine static dust out of your carpet, and it deals well with pet hairs - if you clean daily like us, that is. Our obligatory flour test revealed that in standard mode the Vax visibly removed all the flour from a medium pile wool carpet in two passes! However, when passed along skirting, the Vax Air Cordless Lift didn't collect the flour we scattered in our test for the sides of the head, instead we discovered that when facing the cleaner forward against an edge, it then left nothing behind. Not really an issue, just a different cleaning technique when compared with the brush bar design from the likes of Miele and Dyson. Hard Floors: We’ve been using the Lift on wooden and tiled flooring. Results have been unanimously positive. 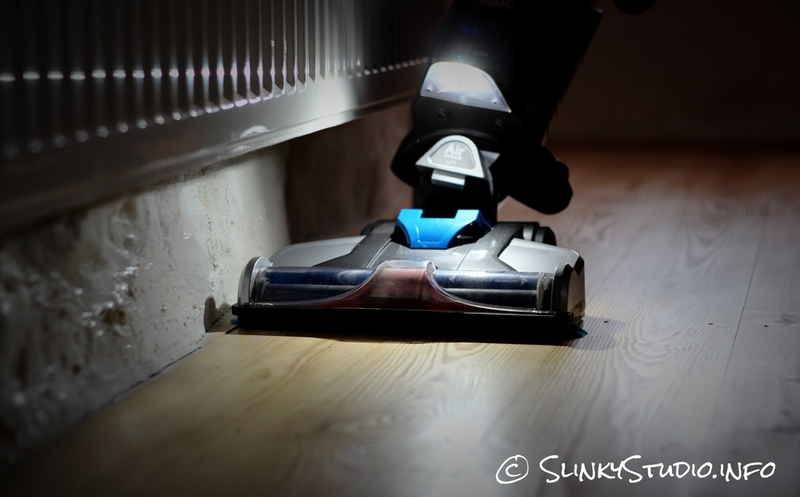 Depending on preference you can disengage the brush bar and enable boost mode for a powerful suction on hard flooring. We tried this method on a wooden floor and whilst it captured dirt, we definitely found improved quantities of dirt removed with the brush bar enabled. The spinning brush gets into the ridges of the wooden flooring to disturb and remove static fine dust very effectively, along with trapped pet hair. Once again performance was on a par with the original Vax Air Cordless. 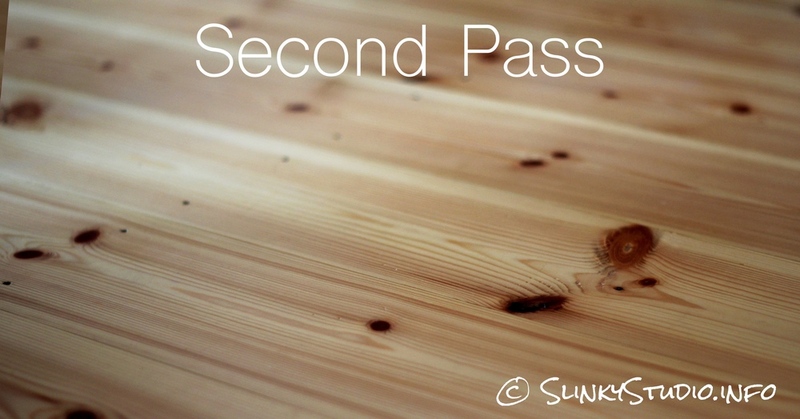 In standard mode flour was removed in just one pass on a wooden floor with ridges! Interestingly we note an identical performance for our flour tests with the Dyson V6 (DC59) Animal in standard mode - but that vacuum is £100 more at £449. To accomplish an agile, unrestrictive hose and floor cleaner from a real traditional upright design, sounds like it could be an engineering nightmare. However, Vax have definitely proved to us that two separate products can happily coexist in one with the Vax Air Cordless Lift. Suction impresses, hose cleaning is dextrous, hard and carpet floor cleaning is great and the 50 minute combined battery life tackles the entire home.